This spreadsheet is designed to help you keep track of your 90 Workout and Fitness program. This is most innovative and exciting way to manage your 90 Day Fitness Journey. All you need, besides your "Bring-It" attitude, is Microsoft Excel. This spreadsheet is designed to help you keep track of your 90 Workout and Fitness program. This is most innovative and exciting way to manage your 90 Day Fitness Journey. All you need, besides your "Bring-It" attitude, is Microsoft Excel. 90 Days Start Date in the Green Box and that gets the ball rolling. This beginning date gets sent throughout the program to setup your Master 90 Calendar Day and your Sculpting Tracker Sheet, and your Cardio Tracker Sheet. Transformation Tracker button to Enter your Beginning Data. This is where you Enter your Beginning Body Stats. That way you will know how far you have progressed at the end of your 90 day fitness quest. You can come back here every 30 days to enter your new numbers. It is easy to complete and only takes a minute or so each time you need to do it. Just Enter your info into the Yellow Shaded Blocks and watch as you body fat % is automatically calculated for you. Or you Enter Your Own Body Fat% Numbers into the Body Fat Calculator Page (There you enter your caliper readings, and the program automatically calculates your body fat % for you) Or just enter your own numbers on that page from some other body fat measuring device and it gets sent back to the Transformation Tracker page. At the end of 90 days, you can come back here, and enter your ending numbers and view the nice graph of your progress. It graphically shows you your change in Weight, Body Fat%, Fat Mass, and Lean Body Mass. You can also enter, and keep track of other body measurements, such as (Chest, Thighs & Biceps). This is just one of the pages where you can view and enter your progress numbers. You also get Day 1, Day 30, Day 60, and Day 90 Photo Pages. You just insert your own digital image from your camera into the pages, where you can keep a handy computer, instantly retrievable photo record. No more looking for the book, and the paper photo, which probably got lost, or eaten by the dog. Click on the Picture Help Link, or the stickey note for instructions, tips, on inserting your picture. Also, on the above pages, you notices little camera images. Those are easy, quick links to yourPhoto Pages. I know that's how we all look on Day 1 right? As you can see from the previous screen shots you have clickable Menu Links at the Top of Every Page. There are logically placed links inbedded in most pages as well. You can jump from page to page with ease in this program. Sometimes you don't even realize you are using a spreadsheet due to all the clickable links and menu items. Now take a look at your Command Center Page. Your Master Calendar . 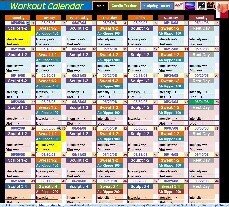 Your Master Calendar is where you can view and manage a nicely color coded layout of all your 90 Day Workouts. This calendar covers all 90 days and is gives you a nice, easily viewable, way to keep track of your workout schedule and progress. This is how the calendar will look when you start. If you remember, the 90 Day Start Date above was 3/10/08. This is sent to the first block below, and the rest of the Dates are automatically calculated for you. The current day's Date is always highlighted in Green for you. I had this open today on 4/20/08 and you can see that date is green. Easy selectable Menu buttons are at the top of this and every page. There are also screen sizing buttons on the page for easier viewing as well. That way you get to see more of the screen. All the above dates, have a Drop-Down Selector, so if you need to change a workout you can, or you can select skipped, if you need to miss a workout. You can also, place an X next to your completed workouts. As you can see, everything is nicely formatted in an easy to use, color coded interface. When your workouts are completed, you just X them off on your Master Calendar . It's a good feeling to watch all your X's add up. The program keeps track of your X's and also summarizes your Intesity, and Meal Numbers at the end as well. The Sculpting Tracker sheet will keep track of your weight and rep numbers if you want. You can get as detailed as you want with this. If you enter your numbers on this worksheet, it will send your numbers to a Summary Sheet, and build also to a nice Progress Tracking Graph Page. You also have worksheet pages you can print out as well. Your Excel 90 Day Workout Manager gives you Advanced Graphing, where you have total control of what data you want to see, and what data you don't want to see. You also get a Cardio Tracker Worksheet as well, to keep a running record of your Cardio Fitness. The little heart symbols are links the Cardio Calculators Page. This program was created with MS Excel 2007 and saved it as a 97-2003 template file which most people have. This is the one you will download instantly once payment is made. (It will be in the XLT format). Click on the Buy Now Button below to pay via PayPal and get your instant download link and start using right away.